"All the food groups are represented. 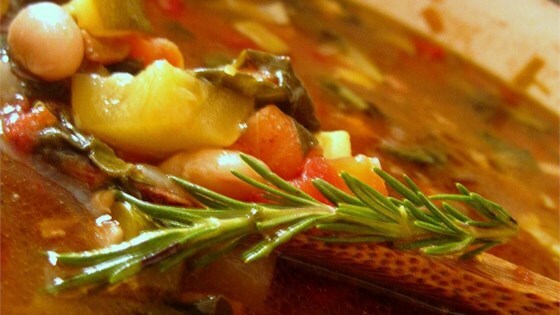 Serve this hearty soup with lightly toasted bread to get every last drop. Recipe can be doubled." Melt butter or margarine in a heavy pot over medium heat. Add onion, celery, and carrots; saute for a few minutes. Add beans, cabbage, tomatoes, tomato paste, potato, stock, garlic, parsley, and salt to the pot. Bring to a boil, cover, and reduce heat. Simmer for approximately 1 hour until vegetables are barely tender. Add pasta, and simmer for 30 minutes more. Correct seasoning, and serve hot with grated cheese.